It will revolutionise the way small businesses tackle the challenge of advertising. And its lateral thinking design means everyone who works with ideas – from students to marketing managers - will appreciate its 'idea generating' power. Adpack equips you with the tools to develop 125,000 different, exciting and innovative marketing campaign ideas – instantly. No books, no studying, no seminars! So what exactly is adpack? 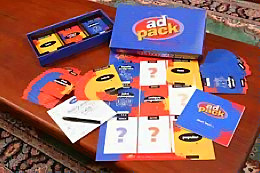 Adpack is a system of marketing strategy cards. There are three packs of 50 cards each. There’s a Media pack, an Offer pack and a Power Word pack. 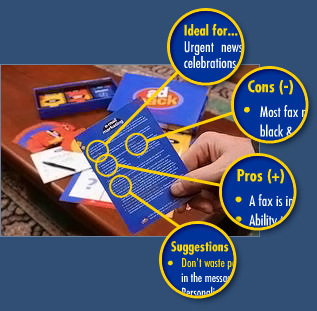 Just combine one of each kind in a three card sequence, and you’ve created a brilliant marketing idea. The cards use proven marketing and advertising formulas, so you can keep coming up with successful campaign ideas over and over again – just by using different combinations of the cards. You get a strategy board to give you a nine card layout and to see how the different combinations can generate amazing creative marketing ideas in front of you, and can trigger ideas for your business. One grid of 3 x 3 x 3 gives you 27 posibilities. The 50 x 50 x 50 card combination gives you 125,000 ideas! You won’t want to put adpack away! Develop thousands of exciting marketing offers to stop people in their tracks. Come up with brilliant marketing strategies to win new customers. Use it as a great brainstorming, lateral thinking and team building tool. No text books, computers, studying or lectures required. Here' s just some of the ideas that adpack helped create. Instead of running an ad in the local classifieds, create simple bin ads and tie them to the bins when everyone has their bins out for rubbish collection. Instead of a plain flyer, why not create a unique marketing brochure that's sure to get some attention. Instead of sending flyers around, develop a database and send a text message to your customers reminding them of anniversaries, birthdays or special events. can be used again and again to generate money making, profitable marketing ideas. Buy it. Try it. We guarantee you'll love it or you get your money back. You can't lose. Adpack is the advertising ideas generator that’ll change it all for you. Brilliant marketing strategies to win new customers. Discover how to secure free advertising. Save thousands by making smarter, more informed choices. Learn where to find free products as incentives! Find who your customers are and where to get more of them. Develop exciting offers to stop people in their tracks. Guaranteed to make a profound impact on your business or your money back! No text books, computers, studying or lectures. Great brainstorming, lateral thinking and team building tool. Easy to use – and fun! – use it again and again. Brainstorming and Teambuilding tool helps improve businesses at all levels. Order adpack today and see why adpack is considered by many to be the most innovative and exciting advertising ideas machine available today.